There have been several instances wherein there are numerous persons complaining about the defect in good or deficiency in service. In such a case, whether every consumer must file his or her claims individually or a class action complaint will be maintainable on behalf of all the consumers? To answer this query, let us first consider the legislative framework under the Consumer Protection Act, 1986. 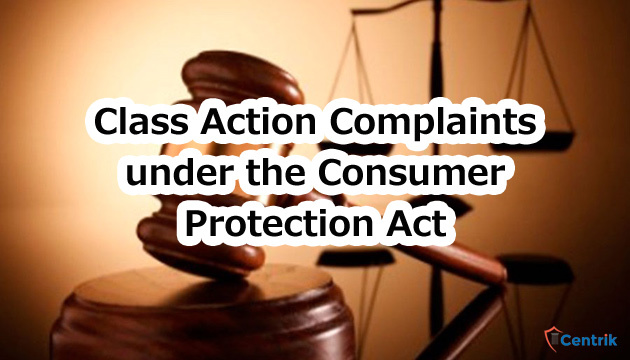 As per section 12 (1) (c) a complaint can be filed by one or more consumers, where there are numerous consumers having the same interest, with the permission of the District Forum, on behalf of, or for the benefit of, all consumers so interested. Section 13(6) of the act states that where the complainant is a consumer referred to in sub clause (iv) of clause (b) of subsection (1) of section 2, the provisions of rule 8 of Order I of the First Schedule to the Code of Civil Procedure, 1908 (5 of 1908) shall apply subject to the modification that every reference therein to a suit or decree shall be construed as a reference to a complaint or the order of the District Forum thereon. The interest of the persons on whose behalf the claim is brought must be common or they must have a common grievance which they seek to get addressed. The defect or deficiency in the goods purchased, or the services hired or availed of by them should be the same for all the consumers on whose behalf or for whose benefit the complaint is filed. It is necessary that such a complaint is filed on behalf of or for the benefit of all the persons having such a community of interest. A complaint on behalf of only some of them therefore will not be maintainable. No group of Firms, Society or Association can file such a complaint unless such group of Firms, Society or Association itself is a consumer as defined in Section 2(1)(d) of the Consumer Protection Act. No person who does not qualify as a consumer in terms of Section 2(1)(d) of the Consumer Protection Act, can be party to a complaint under Section 12(1)(c) of the Act nor can he be amongst the persons on whose behalf or for whose benefit such a complaint is filed. Therefore, as per the above mentioned judgment of the NCDRC, class action complaint can be filed under the Consumer Protection Act, 1986 and it is not necessary for all the aggrieved persons to file separate complaints. In the opinion of the author, this judgment would prevent multiplicity of proceedings with respect to same cause of action and the relief given by the forum would also be available to those who were not able to join the proceedings before it.